The main core of endodontic treatment is achieved by reaching an adequate chemomechanical debridement and filling the entire canal space in three-dimensional manner. Failure to locate all root canals may lead to several complications such as posttreatment disease. Therefore, a sound knowledge of root canal morphology is essential for the successful outcome of root canal therapy. Several studies had been conducted on the root canal internal anatomy mandibular anterior teeth. The incidence of two canals on mandibular incisors was 12%–41.4%,,,,, while in mandibular canines, two canals range from 4.1% to 24%.,,, The two canals may merge into one at the apical third or in rare cases split into two. The purpose of this case report describes the clinical endodontic management of all mandibular incisors and canines, each with two canals of varied configurations in one patient. A 34-year-old Saudi female with no history of any systemic diseases was referred to the Department of Endodontics of Prince Abdulrahman Advanced Dental Institute for endodontic treatment of her mandibular incisors and canines (#33–43). The patient was prepared for prosthetic rehabilitation and his dentist needs to evaluate the endodontic treatment of his mandibular anterior teeth. The patient had no symptoms, and the root canal treatment was done long time ago. The percussion and palpation testes were applied for all teeth and the response was negative, and mobility was normal. 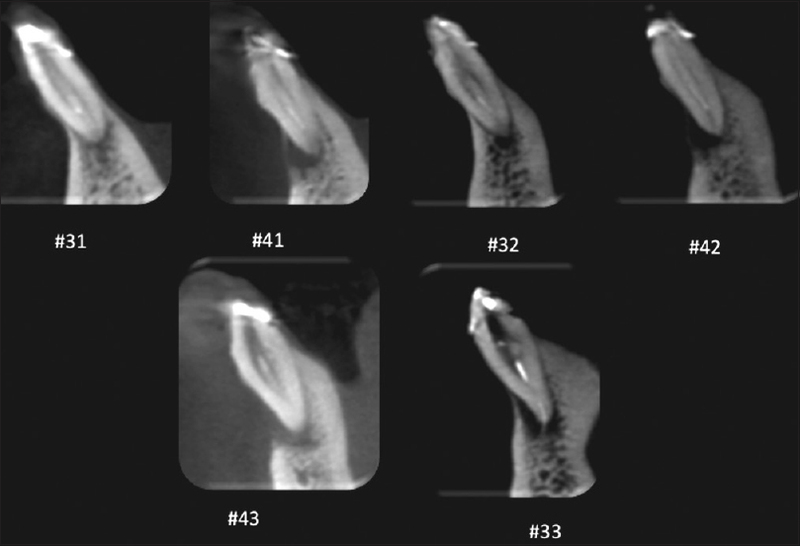 All radiographic images with different angulations had been evaluated and showed inadequate root canal filling and periapical radiolucency at teeth #33–43 [Figure 1]. Based on the clinical and radiographic examinations, the diagnosed teeth were previously treated with asymptomatic apical periodontitis. A plan of nonsurgical root canal retreatment was decided accordingly. All coronal restorations were removed. Then, the local anesthesia with 2% lidocaine and 1:100,000 epinephrine was established and the rubber dam was placed. A careful examination of the pulp chambers under dental operating microscope (Möller-Wedel International Microscopes, Germany) revealed two separated labial and lingual orifices in #33–43 teeth. The root canal filling was removed with chloroform and ProTaper retreatment rotary files (DENTSPLY Maillefer, Ballaigues, Switzerland), access cavity was closed, then rubber dam was removed, and a multiplanar reconstruction cone-beam computed tomography (CBCT) was taken to confirm the numbers and canal configuration of the mandibular incisors and canines' teeth (#33–43). The images of CBCT were obtained with Planmeca ProMax 3D Max CBCT (Planmeca OY, Helsinki, Finland) and showed the general configuration of the mandibular incisors and canines as follow: teeth #33, 32, 42, and 43 were Type III (1-2-1), tooth #41 Type IV (2-2), and tooth # 31 Type V (1-2) according to Vertucci's classification [Figure 2] and [Figure 3]. Rubber dam was placed, and the outline of access cavity was adjusted to establish straight-line access for all canals. The working length was re-established with Root ZX II (J. Morita, Tokyo, Japan) and confirmed radiographically. The instrumentation was done with ProTaper universal files (DENTSPLY Maillefer, Ballaigues, Switzerland) to size F2 using copious irrigation with 5.25% sodium hypochlorite. Then, the canals were dried with sterile paper points and filled with gutta-percha and Endosequence BC sealer (Root Sealer Material, Brasseler, USA) in a lateral compaction manner. Finally, the access cavity was closed with Cavit (Dent-a-Cav, Barmstedt, Germany) and resin-modified glass ionomer filling (ChemFil, DENTSPLY DeTrey, Germany) [Figure 4]. The patient was referred back to the department of prosthodontics to fabricate for final restorations. The follow-up posttreatment radiographs after 12 months showed a complete reduction of the periapical radiolucency for all treated teeth [Figure 5] with no clinical signs and symptoms. An adequate root canal therapy requires sufficient biomechanical instrumentation and obturating the entire canal space in three-dimensional perspectives. The main reason of endodontic treatment failure is missed canals due to ignorance or neglect of the internal anatomy of the teeth., This case report described nonsurgical root canal retreatments of mandibular anterior teeth each with two canals which were missed during the previous treatment. Therefore, every effort should be made by the clinician to diagnose and treat such teeth through using appropriate available armamentaria. Some investigators recommend exposing several angulated periapical radiographs for detecting teeth the morphological variation., Root sectioning, staining, and clearing techniques have been used. 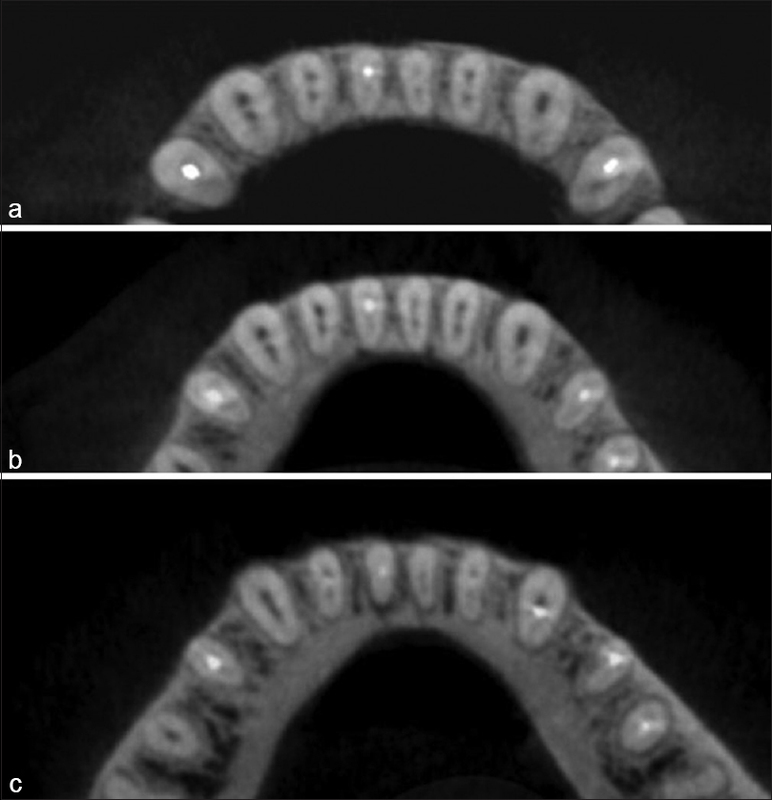 The use of CBCT images is very useful technology in detecting the dental morphological variation. It was used in the current case to identify the potential suspected accessory canals of the treated teeth. The occurrence of two canals in mandibular incisor has been reported in a Saudi subpopulation by Al-Fouzan et al. They found that 70% of the samples had one canal, while the reaming had two. The two canal configurations were of Type III, which is similar most of the teeth of this case. Endodontic treatments of mandibular canine have been described in Saudi population as case reports.,, This report showed the occurrence of two canals in both canines of the same patient in different configuration forms. The process of healing appears subsequently in periapical lesions in case of adequate biomechanical preparation and filling of the entire root canal space. Several studies revealed that healing takes place within 12 months, while others found that this reaction may take several years. However, in certain cases, periapical lesions could heal with scar tissue. Although the outcome of nonsurgical retreatment success is lower than the treatment, in the present case, a complete healing of periapical lesions was observed within the 1st year. The clinician should always pay enough attention to all endodontic treated cases. Utilization of operation, dental microscope, CBCT, and additionally selected appropriate obturation materials will assure a successful outcome. Vertucci FJ. Root canal morphology and its relationship to endodontic procedures. Endod Topics 2005;10:3-29. Cantatore G, Berutti E, Castellucci A. Missed anatomy: Frequency and clinical impact. Endod Topics 2006;15:31-3. Al-Qudah AA, Awawdeh LA. Root canal morphology of mandibular incisors in a Jordanian population. Int Endod J 2006;39:873-7. Boruah LC, Bhuyan AC. Morphologic characteristics of root canal of mandibular incisors in North-East Indian population: An in vitro study. J Conserv Dent 2011;14:346-50.
de Oliveira SH, de Moraes LC, Faig-Leite H, Camargo SE, Camargo CH.In vitro incidence of root canal bifurcation in mandibular incisors by radiovisiography. J Appl Oral Sci 2009;17:234-9. Miyashita M, Kasahara E, Yasuda E, Yamamoto A, Sekizawa T. Root canal system of the mandibular incisor. J Endod 1997;23:479-84. Benjamin KA, Dowson J. Incidence of two root canals in human mandibular incisor teeth. Oral Surg Oral Med Oral Pathol 1974;38:122-6. Calişkan MK, Pehlivan Y, Sepetçioǧlu F, Türkün M, Tuncer SS. Root canal morphology of human permanent teeth in a Turkish population. J Endod 1995;21:200-4. Sert S, Bayirli GS. Evaluation of the root canal configurations of the mandibular and maxillary permanent teeth by gender in the Turkish population. J Endod 2004;30:391-8. Slowey RR. Radiographic aids in the detection of extra root canals. Oral Surg Oral Med Oral Pathol 1974;37:762-72. Fava LR, Dummer PM. Periapical radiographic techniques during endodontic diagnosis and treatment. Int Endod J 1997;30:250-61. Patel S. New dimensions in endodontic imaging: Part 2. Cone beam computed tomography. Int Endod J 2009;42:463-75. Patel S, Patel P. Endodontic management of maxillary second molar with two palatal roots: A report of two cases. Case Rep Dent 2012;2012:590406. Görduysus MO, Görduysus M, Friedman S. Operating microscope improves negotiation of second mesiobuccal canals in maxillary molars. J Endod 2001;27:683-6. Al-Fouzan K, Al-Manee A, Jan J, Al-Rejaie M. Incidence of two canals in extracted mandibular incisors teeth of Saudi Arabian samples. Saudi Endod J 2012;2:65-9. Rahmatulla M, Wyne A. Bifid roots in a mandibular canine: Report of an unusual case. Saudi Dent J 1993;5:77-8. Balto HA, Alwakeel M. Mandibular canine with two root canals – Case report. Egypt Dent J 2007;53:2535-8. Alenazi MA, Al-Hawwas AY. Permanent mandibular canine with two roots and two root canals: Two case reports. Saudi Endod J 2016;6:98-100. Zhang H, Shen Y, Ruse ND, Haapasalo M. Antibacterial activity of endodontic sealers by modified direct contact test against enterococcus faecalis. J Endod 2009;35:1051-5. Nekoofar MH, Stone DF, Dummer PM. The effect of blood contamination on the compressive strength and surface microstructure of mineral trioxide aggregate. Int Endod J 2010;43:782-91. Debelian G, Trope M. The use of premixed bioceramic materials in endodontics. G Ital Endod 2016;30:70-80. Bryan TE, Khechen K, Brackett MG, Messer RL, El-Awady A, Primus CM, et al. In vitro osteogenic potential of an experimental calcium silicate-based root canal sealer. J Endod 2010;36:1163-9. Orstavik D. Time-course and risk analyses of the development and healing of chronic apical periodontitis in man. Int Endod J 1996;29:150-5. Sjogren U, Hagglund B, Sundqvist G, Wing K. Factors affecting the long-term results of endodontic treatment. J Endod 1990;16:498-504. Grung B, Molven O, Halse A. Periapical surgery in a norwegian county hospital: Follow-up findings of 477 teeth. J Endod 1990;16:411-7. Ng YL, Mann V, Gulabivala K. Outcome of secondary root canal treatment: A systematic review of the literature. Int Endod J 2008;41:1026-46.